We are looking forward to seeing our students' photos! 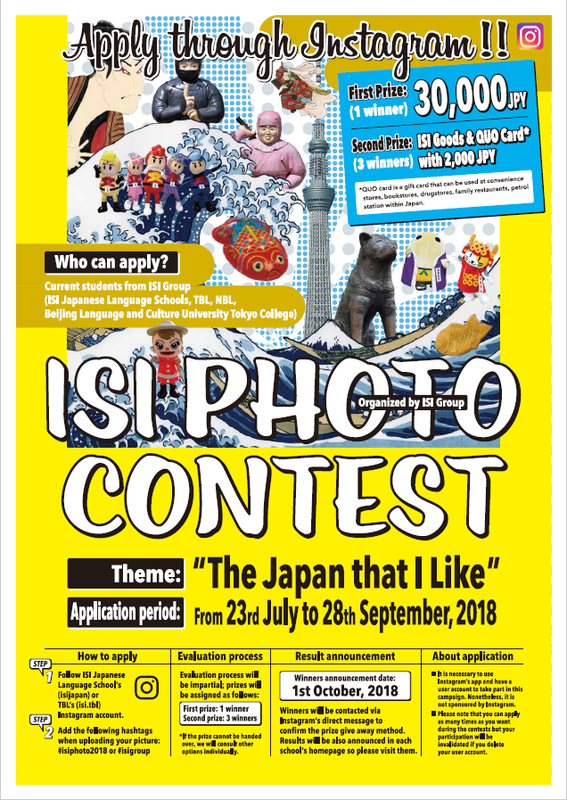 We are holding a Photo Contest in Instagram for all the students that are studying at any of our ISI Group’s schools (ISI Japanese Language Scchool, TBL, NBL, Beijing Language and Culture University). A lot of lovely pictures have been already posted! STEP 1: Follow ISI Japanese Language School’s (@isijapan) or TBL’s (@isi.tbl) Instagram account. STEP 2: Add the following hashtags when uploading your picture: #isiphoto2018 or #isigroup. First Prize (1 winner): 30,000 JPY!! Second Prize (3 winners): ISI Goods & QUO Card with 2,000 JPY!! For more information, please check the image above. We are looking forward to receiving your pictures! !